We have a large stock of 4′-12′ beautiful healthy bristlecone pines still in the ground. We are now taking orders for harvest in the fall. Give us a call for details. The Bristlecone pine tree is native to the western United States and grows primarily in rocky and harsh conditions. It is one of the world’s oldest living organisms with the oldest known living example being dated at over 5,000 years of age. These ancient trees have a fittingly gnarled and stunted appearance, especially those found at high altitudes and have reddish-brown bark with deep fissures. The green pine needles give the twisted branches a bottle-brush appearance. The name Bristlecone pine refers to the dark purple female cones that bear incurved prickles on their surface. They grow slow but are very tough and live a long time. One added bonus, the deer won’t touch them! For shade and privacy trees, we recommend the Colorado Blue Spruce. They can grow up to extreme heights of 100′ and each have large sweeping boughs. These contributing factors make them some of the best shade trees you could have in your yard. If you’re looking for a traditional, large pine tree, the Austrian Pine may be for you. It normally grows in layers, having distinct rows of needles and branches then an empty space. 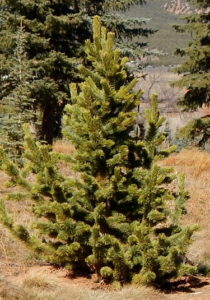 Although they don’t look like your traditional Christmas Tree or full pine tree, they are very good landscaping trees. They are great wind breaks, provide adequate shade, and are very aesthetically pleasing. Call us at (385) 257-0055 or email us by clicking here.